Country fans, are you ready to see Luke Bryan?? That’s right, the four-times winner of the Entertainer Of The Year Award is back once again in 2019 with his most recent album, “What Makes You Country,” with the tour, the Sunset Repeat Tour, named after a song on the album, “Sunrise, Sunburn, Sunset”. 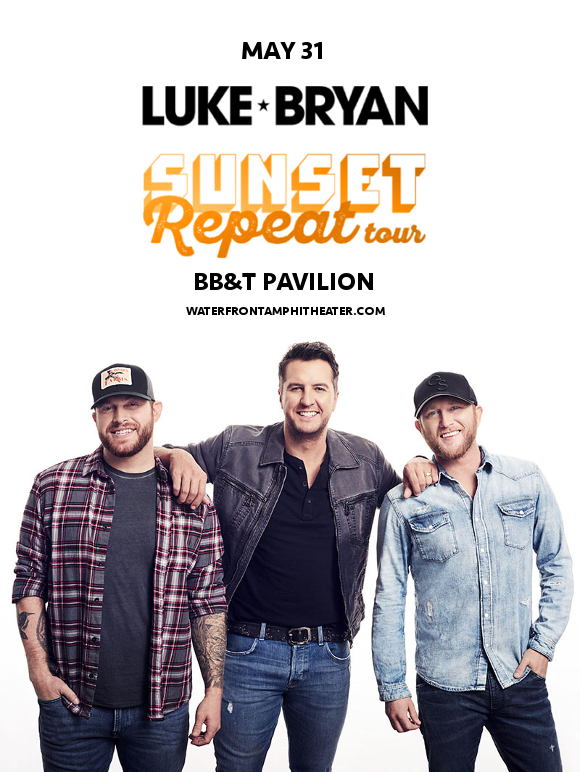 With special support from Cole Swindell, Jon Langston, and DJ Rock, he’s on his way to the BB&T Pavilion on Friday 31st May 2019!! Tickets are expected to disappear FAST for this, so there’s no time to loose – hit the “Buy Tickets,” button and grab yours while you still have the chance!! Starting off writing for massive superstars including Travis Scott and Billy Idol, Luke Bryan moved on to sign with Capitol Nashville and released his first solo album, “I'll Stay Me,” in 2007, to an enthusiastic response from audiences and widespread critical acclaim. Since then, he has released no less than nine further full-length studio albums, containing, in total, an incredible 14 number-one singles!! To date, he has sold over seven million albums and 27 million singles across the world. His music, often tagged in the “bro-country,” subgenre, focuses on the simple pleasures in life, but his most recent album, “What Makes You Country,” while focusing on the same themes, features a more mature overall outlook, with family life coming to the forefront of his lyrical content. Are you ready to see your favourite country star in person?? Now’s your chance – don’t miss it! !